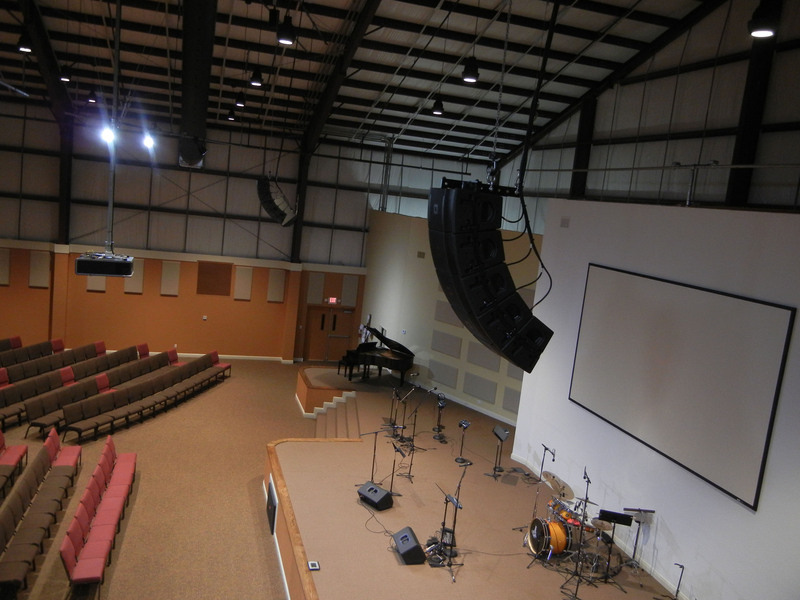 The worship space at the Grace Bible Church in Sebring, Florida, featuring JBL VRX-928 stereo line arrays and a variety of other products sourced through GC Pro. The front-of-house position at the newly opened Sacred Heart Community Center facility at the Knanaya Catholic Congress of Central Florida in Valrico, Florida, featuring lighting and projection technology sourced through GC Pro. WESTLAKE VILLAGE, CA, September 12, 2011 — Every house of worship has its own particular needs, and Guitar Center Professional (GC Pro), the outside sales division of Guitar Center that focuses on the needs of professional users, knows how to meet those criteria better than anyone else. 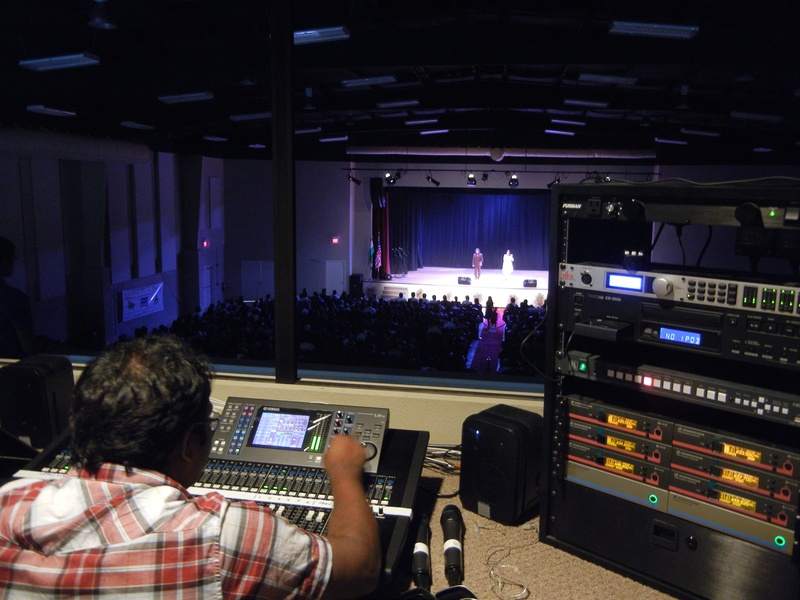 Recently, at the newly opened Sacred Heart Community Center facility at the Knanaya Catholic Congress of Central Florida in Valrico, Florida, and at the Grace Bible Church in Sebring, Florida, the team from GC Pro’s Tampa location designed and supervised the installation of new live sound, acoustical treatment and lighting systems. Notable products included JBL VRX-928 stereo line array PA systems with JBL PRX618XLF subwoofers, Crown XTi 2000 amplifiers, Yamaha LS9-32 digital consoles, Eco-Panel acoustical treatments and Chauvet® LED lighting fixtures. The Sacred Heart Community Center additionally received Altman conventional fresnel and ellipsoidal lighting fixtures. Beyond the deep well of technologies and products that GC Pro brings to the H.O.W. market, it also brings a level of unmatched expertise, like the fact that GC Pro’s Mick Hall, Professional Accounts Manager at the Tampa office, has himself worked in church technology ministry for over 20 years. That combination of great gear, great prices and expertise of the technology and the market make GC Pro the go-to resource for the H.O.W. sector. At the Knanaya Catholic Congress of Central Florida, the new Sacred Heart Community Center, which opened in June, was built to accommodate the congregation’s growth. “The new center seats about a thousand, compared to the 200 the previous center held,” says Hall. Working with A/V systems integrator Christian Sound Installation, a member of the GC Pro Certified Affiliate program, GC Pro guided the equipment choices and helped design system layouts that would let the cultural center be used for a variety of applications, including movies shown via the Panasonic PT-DW6300US projector and a 20-foot diagonal motorized DaLite projection screen that can be recessed for concerts and other live performances. Over at Grace Bible Church, GC Pro helped Matt Christian, the church’s Praise & Worship Minister, make similar choices. With a less complex lighting system, they were able to utilize Show Express software that lets them run the lighting from a laptop instead of a console, saving the church considerable cost while keeping control accessible. Photo Caption 1: The worship space at the Grace Bible Church in Sebring, Florida, featuring JBL VRX-928 stereo line arrays and a variety of other products sourced through GC Pro. Photo Caption 2: The front-of-house position at the newly opened Sacred Heart Community Center facility at the Knanaya Catholic Congress of Central Florida in Valrico, Florida, featuring lighting and projection technology sourced through GC Pro. Celebrating its 10th anniversary this year, Guitar Center Professional is the outside sales division of Guitar Center that focuses on the needs of professional users. Its clientele includes recording studios, audio engineers, producers, recording and touring musicians, live sound venues, post production facilities and more. Emphasizing extraordinary individualized service via local account managers, GC Pro offers expert consultation and a comprehensive selection of the world’s finest equipment for music and audio professionals. More information on GC Pro can be found by visiting www.gcpro.com. Guitar Center is the leading United States retailer of guitars, amplifiers, percussion, keyboards and pro-audio and recording equipment. Our retail store subsidiary operates 220 Guitar Center stores across the United States. In addition, our Music & Arts division operates 101 retail stores specializing in band and orchestra instruments for sale and rental, serving teachers, band directors, college professors and students. We also are the largest direct response retailer of musical instruments and related products in the United States through our wholly owned subsidiary, Musician’s Friend, Inc., and its catalogs and owned or operated websites. More information on Guitar Center can be found by visiting the Company’s website at www.guitarcenter.com.